I was wide awake before the alarm went off. I was THAT excited, knowing what was in store for me that day. 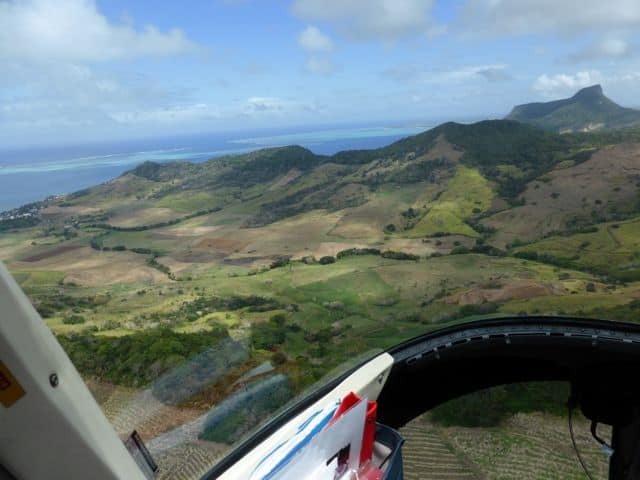 I’d been booked on a helicopter tour of Mauritius and I couldn’t wait to get started! I arrived on this stunning tropical island in the Indian Ocean just the day before and I was spellbound in no time. Mauritius was just too beautiful for words! The light, the colours of the ocean, the imposing mountains, the way the palms sway in the breeze and the smiling faces all around; this island was simply bewitching, and I couldn’t wait to see it from above. 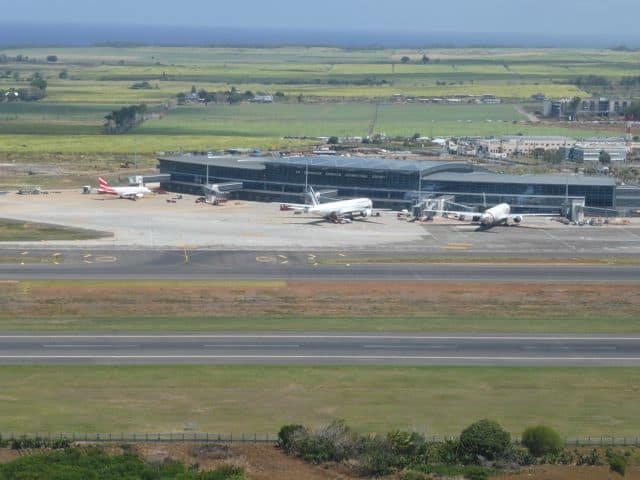 I made my way to the brand new airport and met the Air Mauritius staff for the start of my tour. I hopped into a van and my guide drove me to the helipad at the southern corner of the airport. The helicopter was waiting! “I’m SOOOOO EXCITED!!!”. The pilot smiled at me – he must hear this many times a day on these helicopter tours! “Are you ready?”, he asked. I nodded excitedly and next thing I knew, we lifted off the ground like a feather. The island’s magnificent coastline unfolded before me in an instant. I gasped! Blue Bay was the first thing I saw as soon as the heli lifted off! The first thing we saw was Blue Bay – no need to guess why it’s called that! From here, we flew past the coast in an easterly direction. The pilot pointed out various bays and lagoons, as well as resorts and villages. His commentary about the topography of the island and bits of its colourful history was lost on me. I was too awestruck to listen. We flew over turquoise lagoons and green islets, sparkling white beaches and coral reefs, fishermen in their boats, people snorkelling … it was mesmerising! 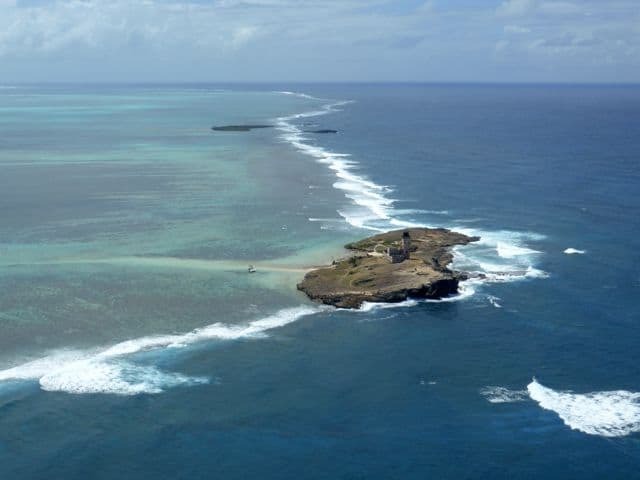 The spectacular southern coastline of Mauritius, with the Ile aux Aigrettes nature reserve in the lagoon. The old lighthouse on Ile aux Fouquets at the edge of the lagoon. The fishing boat looked like it was floating on glass! I don’t play golf but I’d love to learn here at the Le Touessrok Golf Course! When we reached the town of Bel Air, we left the coast and headed into the mountains. In an instant, we were surrounded by forested slopes and craggy peaks! The pilot tilted the helicopter upwards as we crossed the mountain ridge and we felt the thermals lift us higher. We flew along the steep slopes of the mountains, criss-crossing the ridge and dipping into verdant valleys. It was an exhilarating experience! The pilot weaved a path through the mountains and valleys. Verdant valleys and forested mountain slopes. The bright blue ocean was never far away. 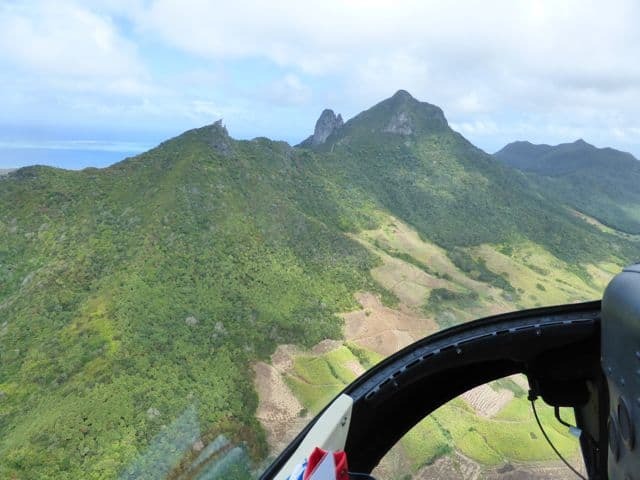 We soon left the mountains and continued in a southerly direction towards the towns of Vieux Grand Port (Mauritius’ old capital) and Mahebourg, before heading back to the airport. Back to the Sir Seewoosagur Ramgoolam International Airport. The helicopter tour lasted 20 minutes but it was the most spectacular 20-minute tour I’ve ever experienced! The jaw-dropping panoramas and the amazing colours were simply unforgettable. 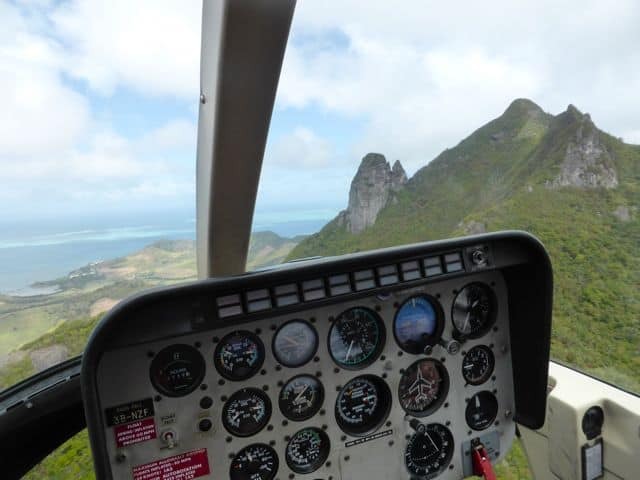 Seeing Mauritius from the air, be it from a helicopter, microlight aircraft or seaplane, is a must-do for every visitor to Mauritius! No question about it. 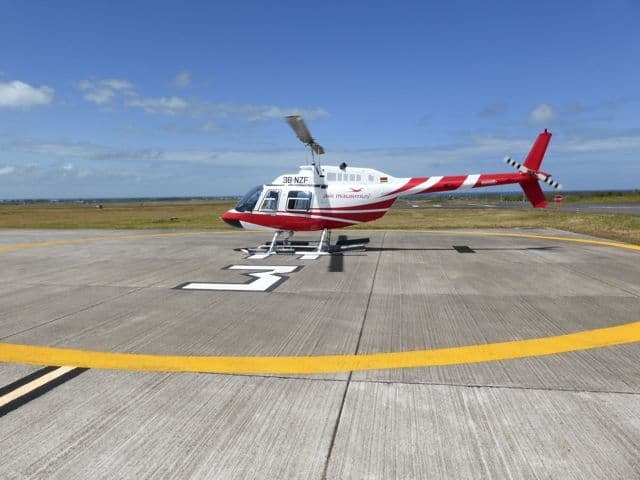 Alternatively, Air Mauritius Helicopters offer arriving visitors a quick heli-taxi service to the main hotels and resorts. Now, that’s a way to arrive in style and catch the island’s spectacular views at the same time! You went on it? Stunning isn’t it? A true highlight of my trip to Mauritius! Wauw those views are simply amazing. I cannot believe how blue that water is! Would LOVE to go snorkeling there! I am not sure the term breathtaking even does it justice. Stunning. What I love most is how “unspoiled” Mauritius seems. Fantastic photos and I hope I get the chance to do this in the future! So glad you had a fantastic time! It was amazing! I’ve been in a heli several times now but this is one ride I won’t forget. 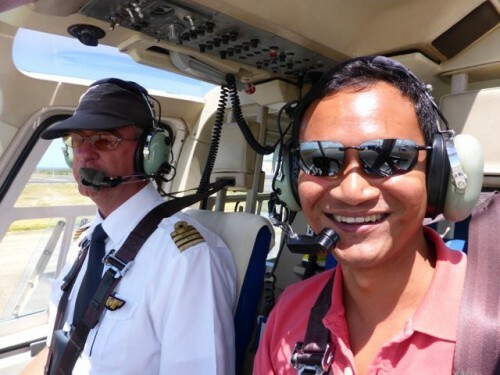 Looks great, Keith… not long ago, we had a helicopter ride over Trakai in Lithuania and it was a fantastic experience. I’m sure it would be equally amazing, if not more so, in Mauritius. Wow mate, that is absolutely beautiful! Looks like you had a blast while getting some great views. wow! I can almost feel the excitement.. it is truly stunning, thanks for sharing Keith. and the Golf Course would be an excellent reason to return..
AWESOME…….is the only way i can describe it. Paradise…. wow it looks like a stunning experience getting to see the place from above really gives things a whole new perspective. The water looks so beautiful the whole island looks great, seems a very worthwhile tour to take! 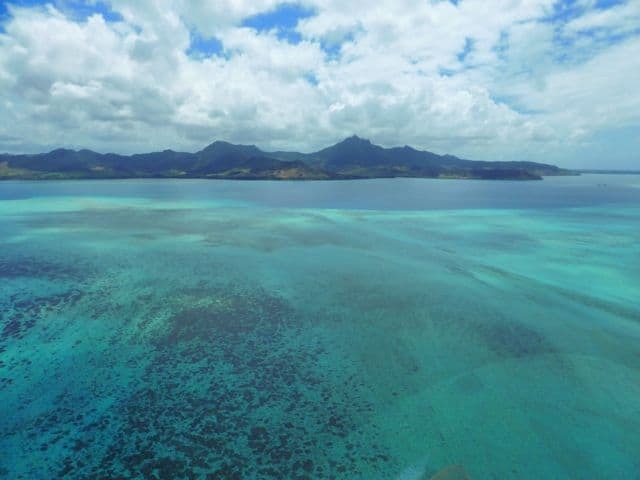 These photos from the air are a great portray of Mauritius. I love the photo of the Touessrok Golf Course, surrounded by water, very beautiful.